Tyagaraja’s mastery over music and lyrics and his towering genius have inspired many a composer. To this day, the prolific composer’s compositions are a template for others. Born around the same time as the other members of the trinity, in what can be called an epochal time in the history of Carnatic music, he made krithi the mainstay of the tradition. But who could have inspired him? A look at Tyagaraja’s body of work, his biography and the history of the region might give us some pointers. To say that ramabhakti permeated his life and compositions is an understatement. The most popular picture of him drawn in his lifetime and other hagiographic pictures portray him as a bard with the tambura in one hand, ‘chirata’ (the small percussion instrument) in the other, and lost in bhakti. As much as he composed those so-called ‘heavyweight’ compositions including the ‘Pancharatnas’, which became the mainstay of the Carnatic tradition, there were not few but many devotional, lyric-centred Divyanama Sankeertanams suitable to be sung at Bhajana-Goshtis that might have come out during his puja, unchavritti and other rituals. The Bhajana Sampradaya tradition started by Sri Bodhendra Sadguru Swami was well-established by his time and its influence can only be expected. While the krithis like ‘Namakusumamula’ and ‘Bhajana seyave’ extol the practice of Namasamkeertanam, Rama Kodandarama (Bhairavi) and Rama Rama Neevaramu showcase it. Bhagavatamela tradition in and around Tanjavur was also very strong at the time, courtesy the patronage of the Nayaks. Melattur Venkatarama Sastry lived not far before Tyagaraja. Narayanateertha is also associated with this tradition. We can see its influence in his Yakshaganas, which are more of Sangeeta Natakams, namely Prahlada Bhakti Vijayamu and Nauka Charitram. Tyagaraja pays homage to Narada in Prahlada Bhakti Vijayamu and in a few of his krithis, prominent one being ‘Sri Narada Muni’, where he addresses him as guru (“gururaya”). Purandaradasa too is praised in the form of a padyam, and krithis like Grahabalamemi (inspired by Sakalagrahabala neeve sarasijaksha) show his influence. He always considered himself a part of the Bhagavata-parampara and sang about it in krithis like ‘Endaro Mahanubhavulu’ and ‘Vidulaku Mrokkeda’. In Seetamma Maayamma, he lists the Bhagavatas starting from Shankara and says “dhara nija bhagavatagresarulevaro varellaru Tyagarajuniki parama bandhavulu manasa” – the foremost Bhagavatas on this earth are very closely related to him. There are poems on Narayanateertha, Goswami Tulasidas and others in his Yakshaganams. He composed ‘Manasa Sancharare Rame’, probably inspired by Sadashiva Brahmendra’s ‘Manasa Sancharare Brahmani’. The Vibhakti (noun case) too matches except that for Tyagaraja, Rama was the ‘Brahman’. Kancherla Gopanna, popularly known as Bhadrachala Ramadasu, was the other prominent composer who composed on Rama and is referred by Tyagaraja in the krithis ‘Ksheerasagara Shayana’ and ‘Kaligiyunte’. Apart from this, it’s astonishing to see the number of Pallavis shared by the two. Some examples are ‘Etulabrotuvo’ and ‘Etubotivo rama etubrotuvo’, ‘enduku dayaradura’ and ‘enduku dayaradu srirama’, ‘ela nee daya raadu’ and ‘ela daya raade ramayya’ – and we are only talking about the akshara ‘e’. There are other krithis like ‘ramabhadra rara’ and ‘rama rama neevaramu kava ra ra’. [h=1]Hundreds of musicians render Thyagaraja kritis in Thiruvaiyaru[/h]Thanjavur: Hundreds of musicians gathered at the samadhi of saint composer Thyagaraja to pay homage by reciting his pancharathna kritis in chorus at the 171st aradhana held here at Thiruvaiyaru on Saturday. A large number of musicians, old and young, maestros and students, converged in front of the saint's samadhi to recite the saint's kritis. Eminent personalities including Sudha Raghunathan, Sirkazhi Siva Chidambaram, Mahathi and several others paid homage to the saint. The event commenced at 8am with the traditional 'Mangala Isai'. Earlier, a portrait of the saint was brought in a procession from Thyagaraja Kutir to his Samadhi, where special puja was performed to the statue of the saint. The fest was concluded at 11 pm with Anjaneyar (Hanuman) procession. [h=1]Musicians pay homage to saint Thyagaraja[/h]The ‘Aradhana (singing in chorus)’ is held every year on Pushya Bagula Panchami day, when the saint attained ‘Samadhi’. 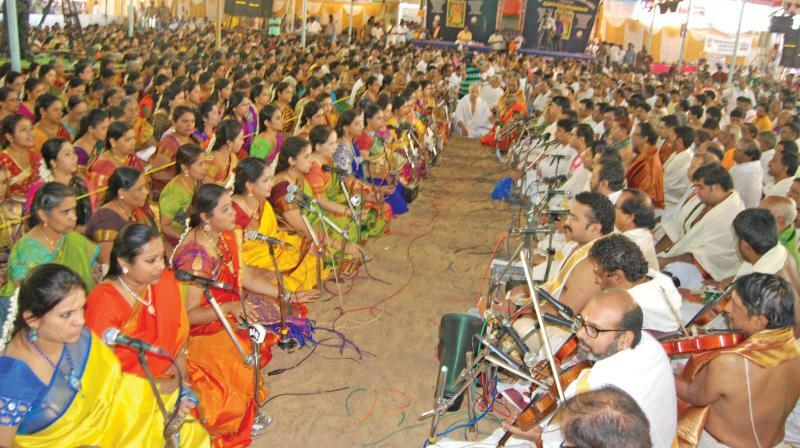 THANJAVUR: Hundreds of musicians paid their homage to saint-composer Sri Thyagaraja by singing his Pancharathna Kritis (compositions considered as five gems) at the 171st ‘Aradhana’ of the saint at his ‘Samadhi’ on the banks of Cauvery at Thiruvaiyaru near Thanjavur on Saturday. The ‘Aradhana (singing in chorus)’ is held every year on Pushya Bagula Panchami day, when the saint attained ‘Samadhi’. It was a divine experience for people who watched the singing which started at 9 am and went on for an hour. Nathaswaram recital and playing of flute preceded the chorus singing. The ‘kritis’ sung in chorus were “Jagadanandakaraka” in Nattai Ragam, “Dudukugala” in Gowlai Ragam, “Sadhinchene” in Arabhi Ragam, “Kana Kana Ruchira” in Varali Ragam and “Entharo Mahanubhavulu” in Sri Raagam-all the kritis set to ‘Adhi Thaalam’. Eminent Carnatic musicians who led the chorus included Ms. Sudha Raghunathan, Sirkali Sivachidambaram, O.S.Arun, Mahati, Ranjani, Sasi Kiran, Srikali T.V.Parameswaran, Haridwaramangalam A.K.Palanivel, Srimushnam Raja Rao, Sheik Mehboob Subhani and party. Mr. G. Rangaswamy Moopanar, president of ‘Sri Thyagabrahma Mahotsava Sabha’ attended the ‘Aradhana’. Earlier, an ‘unchavruthi bhajan’ procession was taken from the house of Sri Thyagaraja on Thirumanjanaveedhi to the ‘Samadhi’. The Idol of Thyagaraja was taken in a procession with Mallari in the evening. This year the ‘Aradhana’ started on January 2 and Tamil Nadu Governor Banwarilal Purohit inaugurated the festival. Famous musicians like K.J.Jesudoss paid their homage to the saint during the festival. Born on 1767 at Tiruvarur, saint-composer Sri Thyagaraja settled down at Thirumanchana Veedhi at Thiruvaiyaru, where he lived till he attained ‘Samadhi’. He composed countless kritis in a rich variety of rare and common ragas. ‘Rama Bhakthi’ and ‘Nadopasana’ are the two cardinal features of music of the saint. Another important contribution of Sri Thyagaraja, hailed as one among the trinity of Carnatic music, lies in his improvisation, known as ‘Sanghithis’. A devoted worshipper of Lord Ram and an inspired composer of Bhajan songs and classical music and spiritual philosopher, the saint is believed to be the incarnation of sage Valmiki.